Yvonne Koolmatrie has lived all her life in Ngarrindjeri country, which ranges from the Coorong, a wetland wilderness at the mouth of the Murray River, upstream to the present day farming communities of the lower Murray Riverland. Koolmatrie grew up in the Riverland and experienced the hardship of seasonal work that became the only means of survival when Aboriginal people were denied access to their traditional lands. Throughout her youth, Koolmatrie saw little evidence of the cultural practices of her ancestors that have become her life's work. At a one-day weaving workshop in 1982, conducted by the elder, Dorothy Kartinyeri – one of the last people practicing the coiled bundle technique Koolmatrie learned the critical first stage of Ngarrindjeri weaving. She was also instructed in the correct harvesting and preparation of sedge grass. In the once fertile environment of the Riverland, now degraded by intensive agricultural practice, suitable supplies of rushes are rare. Koolmatrie is careful not only to guard the location of her source, but also in harvesting, so as not to disturb the roots and young sedge grass plants. The subtle scent, form and hue of the finished works palpably evoke the environment of the Murray River. Koolmatrie began to practise the weaving technique and gradually to experiment with form, extending the range of objects she had studied in the South Australian Museum '... to put my story in my weaving'. For Koolmatrie, the near loss of the Ngarrindjeri weaving tradition crystallised a twofold responsibility: to pass on her skills and to create work of the highest possible standards so that her fibre forms will endure for future generations. 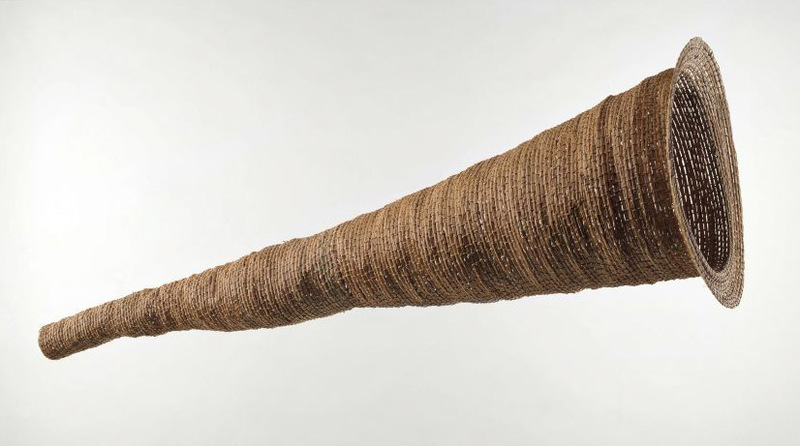 'Eel trap', 1997, was first exhibited in 'fluent', Australia's representative exhibition at the 47th Venice Biennale in 1997, which also featured the work of Emily Kame Kngwarreye and Judy Watson. Created to the scale of nineteenth-century works in the collection of the South Australian Museum, Koolmatrie's eel trap does not intend to break with tradition but rather explores the possibilities of innovation. She has said, '... I look at different things. I might be along the river and I see different shapes and I think, that's a good way to weave. I don't sketch it, I just get my rushes and start to weave.' Koolmatrie's intuitive process allows the sculptural potential of functional objects to be realised in spirited interpretations of traditional forms.